Scorching pace: Traders work at the Brazilian Mercantile and Futures Exchange in Sao Paulo. Brazil has been the most lucrative of the four Bric markets for global investors. 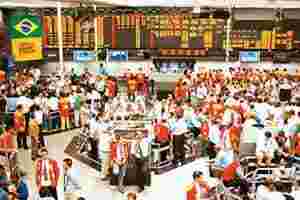 New York: October may be best known to investors for the stock market crashes of 1929 and 1987. Yet another event took place four years ago that investors may be more inclined to celebrate. Monday was the anniversary of the publication date of Dreaming with Brics: The Path to 2050, a report by Goldman Sachs Group Inc. economists that popularized the acronym for Brazil, Russia, India and China. The four developing countries as a group may account for more of the world’s economy than France, Germany, Italy, Japan, the UK and the US combined “in less than 40 years," or by 2033, the study concluded. The Bric stock markets have been on a tear since then. Brazil has set the pace, as the Bovespa index rose sixfold in dollar terms and closed above 60,000 last week for the first time. Benchmarks of Russian, Indian and Chinese shares have tripled and then some. All four of the Bric nations have beaten the Morgan Stanley Capital International (MSCI) Emerging Markets Index, which more than tripled during the period and rose to a record on Monday. The MSCI World Index of developed markets gained 81%. What’s more, investments in BRIC equity funds have “recovered some traction after slipping badly earlier this year," EPFR Global said in a statement last week. The funds took in $828 million in the past five weeks, enabling them to recoup most of a $1.2 billion outflow through mid-August, according to the Boston-based firm’s data. Brazil has been the most lucrative of the four markets for global investors because its currency, the real, has gained the most against the dollar since Goldman publishedits report. The real’s appreciation accounts for almost half of the Bovespa’s gain in dollar terms. The rest comes from Brazilian stocks such as Cia. Vale do Rio Doce, the world’s largest iron ore producer, whose shares have soared ninefold. None of the index’s members that traded publicly four years ago has dropped indollar terms, according to data compiled by Bloomberg. The same is true for theholdovers in the Russian Trading System Index, India’s Sensex and Hang Seng’s China Enterprises Index. Even some optimists are saying the gains won’t go on forever. The risk of a “bubble" rose after the US Federal Reserve’s interest rate cut last month made more funds available to invest in developing countries, said Michael Hartnett, a New York-based emerging markets strategist at Merrill Lynch & Co. For now, the fourth anniversary of Goldman’s report on the Bric nations may give stock investors a reason to celebrate—unlike, say, the 20th anniversary of the 1987 crash.